As NPR's Anastasia Tsioulcas recently detailed, finding classical music in the streaming era can be difficult, and the same goes for keeping up with new releases. I subscribe to The New York Times's classical playlist on Spotify, which provides the occasional lead but seems unfocused overall. I get some scoops from various label newsletters, as well as by signing up on the websites of new music ensembles. There are also a few excellent PR firms that update me in this arena, which definitely helps. It was one of those firms that tipped me to Orli Shaham's excellent Brahms-themed collection, which I reviewed in part one of this micro-miniseries. Even with all those tributaries feeding my classical needs, I can't for the life of me remember how I found out about the album I discuss below, or even what drew me to it. Read on and remember that you heard about it from me! SWR Vokalensemble Stuttgart - Italia Part of a series focusing on the choral traditions of various countries, Italia is a brilliantly sequenced survey of Italian compositions from the 19th and 20th centuries. While Italy doesn't have the same depth of choral music that Germany and England boast, it does have Verdi, who slathered his operas with choral music at every opportunity, with profound dramatic and musical impact. Also, his Requiem is one of three essential entries in the genre, alongside Mozart and Brahms. So Verdi is a natural place for conductor Marcus Creed to begin, opening Italia with two of Verdi's 4 Pezzi sacri. A quick survey of other takes on this oft-recorded masterpiece immediately reveals the SWR's strengths as they deliver a performance of elevated clarity, seamless vocal blend, and transporting engagement with the subject matter. Before the first of the pieces is over, you know you're in good hands and ready to buckle in for a trip to wherever they want to take you. The next stop is in fact Yliam, a 1960's work by Giacinto Scelsi reminiscent of some of Ligeti's interstellar excursions, a sound that will be familiar to fans of Kubrick's 2001: A Space Odyssey. In this concise and intense piece for female singers, the sopranos and altos pursue separate lines that occasionally criss-cross like strands of DNA in the air. Scelsi was an autodidact in both composition and mysticism and he ties both interests together nicely in Yliam. Scelsi's work blends smoothly into another Verdi piece, O Padre Noster, which is not without its own brand of incense-laden Catholic mysticism. The baritones and basses really distinguish themselves here, singing with a veiled power that is all the more impressive for its restraint. Then we come back to 1960 with Luigi Nono's Sara Dolce Tacere (Such Sweet Silence, perhaps? ), a setting of Cesar Pavese's La terra e la morte (Earth and Death) for eight soloists. 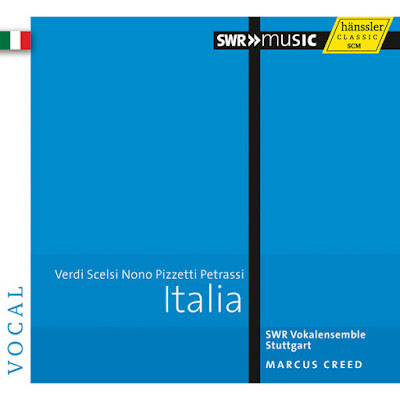 Creed wisely chose something by Nono that fits with the preceding Verdi and Scelsi pieces rather than going with one of Nono's explicitly political works. Sara Dolce Tacere has the feel of a group dialogue or a study in dynamics, with voices rising and falling, seeming to appear and recede like waves on a stony shore. Ildebrando Pizzetti was born in 1880, when Verdi was entering his last and possibly greatest decade, premiering operas such as Aida, Don Carlo, Simon Boccanegra (a personal favorite), and Otello. This extraordinary run may have had an effect on other composers born then - the "Generation of 1880" - as they largely avoided creating operas. Pizzetti himself was unintimidated, however, composing more than a dozen operas, all largely forgotten, and even a Requiem. His Tre Composizione Corali, however is nothing so grand. While fairly conventional, it creates a peaceful atmosphere with song-like melodies and a chant-like blend of voices. The third piece, Recordare, domine, may be a little overlong at 10 minutes but that's a minor complaint. Nono the Marxist would probably object the loudest to Pizzetti's inclusion here, as the latter was occasionally cozy with Mussolini's fascist government. Pizzetti's conservatism is quickly blown away by Scelsi's TKRDG, also a three-part work, for six male voices, percussion and electric guitar. This is just a fantastic and fascinating piece, incorporating Japanese and Indian influences with both irreverence and respect, creating a ritualistic soundscape that the SWR inhabits completely. The interaction between the vocalists and the instrumentalists is more natural and assured than other recordings I've heard, aided in part by the excellent production, and may make this the definitive rendering of this important piece. In my mind, TKRDG connects the avant garde elements on Italia to that other Italian genius, Ennio Morricone, who is a big fan of Scelsi - your ears will likely agree. The album closes with Goffredo Petrassi's five-part Nonsense, based on limericks by Edward Lear and composed in 1952. Petrassi's long life nearly covers the entire period represented here, as he was born in 1904 and died in 2003. He was known for being open to new ideas and his writing in these short, lighthearted pieces seems tied to no particular era. It's a delightful way to end the collection and leaves you marveling at the SWR's versatility and verve. I look forward to exploring the other releases in the series and seeing what Creed and the ensemble do next. P.S. Creed is on a roll this year, having just released L'amour et la foi, a wonderful album of vocal music by Messiaen performed by the Danish National Vocal Ensemble. Even if you're familiar with 3 Petit Liturgies and the other pieces this is worth a listen. 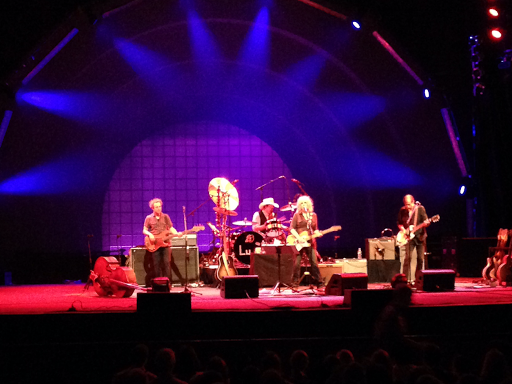 Though I've been a fan for 20 years, I've never seen Lucinda Williams on stage. This is not due to any edict on my part, just the means and motive never matching up with opportunity. So suffer this fool gladly, or at least kindly, if what I'm about to say is common knowledge: Lucinda Williams is a master. Or maybe she has only become more so now that she's getting close to a 30 year career. In any case, she is at that rare place as a performer where she is both completely herself, a true original, while never shutting the audience out. Her comfort zone includes areas of extreme power, enough to even be discomfiting at times. A case in point is Unsuffer Me, now quite a different beast than the version I remember from West, which was maybe a little overproduced and shy of itself. No more. It's a journey into the blackest heart of darkness, such that a chill went down my spine when she first intoned "Come into my world of loneliness, of wickedness, of bitterness, anoint my head with your kiss." This is longing and bottomless need, expressed with and utter lack of self-consciousness. In this, as in all things during the concert I just saw in Prospect Park, she is perfectly matched by guitarist Stuart Mathis, who must be one of the best six-stringers around now, on the road and on record. He came loaded for bear with about eight gorgeous instruments, which he deployed perfectly, fitting their strengths to each song. How Mathis comes up with one solo after another that feels fresh, emotionally engaged, virtuosic, wonderfully gritty and a little dangerous is one of the wonders of our age. The bassist and drummer were spectacular as well, locking into that groove that distinguishes William's best work. It's hard to imagine a better band on tour this summer. The concert was also an expertly sequenced slice of her vast catalog of songs, showcasing a lot of the tougher side of her canon. This connected completely with her body language, which has her moving in a way that has nothing to do with display. This is the way I dance, she seems to be saying, get used to it. Her toughness always contains compassion, though, which allows her to deliver songs like Drunken Angel with a hard-won tenderness, as if she just wrote it yesterday. She can also have fun, belting out The Clash's Should I Stay Or Should I Go with a delightful insouciance during the encore. So here we have an American treasure, still propelled by the jetstream of one of her finest albums (Where The Spirit Meets The Bone), in excellent voice, phrasing like a jazz singer, and accompanied by an excellent and sympatico trio of musicians with plenty of personality of their own. What are you waiting for? See Lucinda Williams. My parents were out at a museum opening. I hung over the side of the bed, watching the hall, waiting to hear the front door open. I wasn't a particularly needy kid but for some reason I couldn't get to sleep until they got home. It might have been a sort of silent protest against what I saw as an egregiously early bedtime. I was around 12 years old and not tired at all. They eventually returned and there were all the usual noises of closets and coats before they headed down the hall to their room. They came in to check on me and were glad to find me awake as they had a little present: A postcard from MoMA featuring a great Roy Lichtenstein painting of military machinery. "Here," my father said, "we thought this would be something you would like." The way he said it, I knew that they didn't think much of Lichtenstein but were happy to find something with which I would find affinity. And did I ever: it was art-love at first sight. I remember feeling a sense of recognition: here is something just for me, as if custom-made. My parents had found something for me that I didn't even know I was looking for - a tacit acknowledgment of something I didn't yet realize. I was different than them, and maybe from a lot of people. I pinned the postcard to the wall above my pillow, next to the autographed photo of Walter Koenig, and went to sleep. It was wonderful waking up in a world where I knew I could find art that would feed my soul and with a little more self-knowledge to help me find it. A few years later I was getting ready to leave a friend's house after an afternoon spent listening to music. "Here," he said, handing me an LP, " I think this is a bunch of noise but you might like it." It was Ornette Coleman's early masterpiece, Free Jazz. He was right on both counts - it was a bit noisy and I loved it. While there was a lot to absorb in the two side-long collective improvisations that made up the album, the thing that immediately grabbed me was Ornette's tone on alto, a sound as immediately recognizable as Jimi Hendrix's guitar, and filled with a feeling of complete exuberance. There was the sound of life itself coming out of that plastic sax and I had to hear more. Through a friend of a friend of a friend I found myself in music critic Chip Stern's apartment where he was selling promo copies. Besides a white label copy of Remain In Light, I also scored Body Meta, Ornette's first album with his electric band, Prime Time, and Soapsuds, Soapsuds, a series of duets with bassist Charlie Haden. Body Meta was a revelation, from that first mind-blowing appropriation of the Bo Diddley beat, to the explosive tangles of sound when Ornette and his cohort achieved maximum liftoff. And it really felt like that, the room shifting around you as guitar lines shattered and reformed, the bass hovering just in front, then just behind, the beat, and Ornette's joyful squall slathered all over everything. The first "new" Ornette album I bought was Of Human Feelings (now unconscionably out of print), which was recorded in 1979 - recorded digitally, I might add - but not released until 1982. It was put out by Antilles, a subsidiary of Island records, and could sort of be seen as a pop bid by Ornette, like Star People by Miles Davis. While it has its catchy moments it was unlikely that smooth jazz radio was going to play this stuff, though. I loved it instantly and was by then a fan for life. It was much later that I learned about his history of rejection, how he was denied entry into the academy, although he had a mind full of symphonies, then laughed out of L.A., and almost laughed out of NYC, his plastic sax and wild ideas magnets for derision. But he persevered, making a series of landmark albums and even getting the opportunity to record one of those symphonies, Skies Of America, for Columbia Records. But, unlike Miles Davis, who always managed to muscle into the center of the culture, Ornette remained an outsider and I can't deny that that's part of his appeal for me. It's only so much time left in this crazy world." I imagine Ornette might have felt the same way. But it's the music that helps us find each other, starting with the musician's self-recognition in the sounds that resonate with them. Never mind the pronouns, Lou Reed was talking about himself in Rock & Roll: "She started dancing to that fine fine music/You know her life was saved by rock & roll." So I'm an Ornette person. I know this about myself as much as I know that he's not for everyone. The other album I bought from Chip Stern, Soapsuds, Soapsuds, featured a gorgeous fantasia on the theme to Norman Lear's mock-soap opera, Mary Hartman, Mary Hartman. As it happens, my family was obsessed with that show and it was in fact the catalyst to getting my bedtime officially changed so I could stay up and watch it. Hearing Ornette float those iconic notes alongside the ruminative bass of Charlie Haden was another startling moment of recognition. Sure I was an Ornette person but maybe - just maybe - Ornette was a Jeremy person, too. In the year I was born, four arty scrappers who couldn't decide between the High Numbers and The Who as a band name were playing some of their first gigs in England. In one recording from those days, they repeatedly launch into I Gotta Dance To Keep From Crying in between covers of songs by Bo Diddley, Little Richard and their more advanced contemporaries, The Kinks. Like The Yardbirds, they also did Here 'Tis and Smokestack Lightning, but they didn't have the unstoppable energy of McCarty, Dreja and Clapton working together. They also couldn't match John Lennon's throat-shredding blast through Money - but they tried. Overall, they were pretty good, maybe a cut above your cousin's band, but only just. Imagine being there, watching one of the greatest bands of all time in their nascence. Would you be able to tell that great things were coming? Or would you think they were merely another noisy bunch of strivers like David Jones and the Lower Third playing just down the street? Of course, I'll never know, as crawling was still in my future and seeing music even further off. 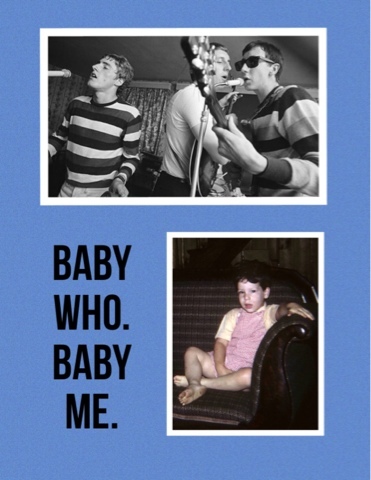 So I missed The Who in 1964 and I'm OK with that. When Keith Moon died in 1978 I was just on the cusp of my serious concertgoing years. During the decade prior, The Who had become perhaps one of the most formidable live acts in human history. Even Liszt and Paganini, who both tore it up in the 19th century, would have hesitated before following Townsend, Daltrey, Entwistle and Moon on stage. In performance they had excelled far beyond any of those they emulated in 1964, and minus The Beatles, in songwriting as well. This I knew full well from the Live At Leeds album, of which I knew every note, and fascinating studio works like Who's Next, Quadrophenia and Who Are You. But thanks to a combination of my age, lack of discretionary funds, and an older brother who was more into jazz than rock, I never saw The Who in those years either - and I'm OK with that. Kenney Jones was soon behind the drum kit, and while he had skills and pedigree, he lacked charisma and The Who were irrevocably a different band. While I could enjoy You Better You Bet, it took me years to realize that Face Dances is one of the best pop albums of the 80's. I think I considered seeing The Who at Shea Stadium in 1982, but it was probably too expensive and I was slightly disturbed at the idea of my heroes The Clash as an opening act, especially so shortly after they had ruled the stage at Bond's. Then The Who officially broke up for the first time and I spent the rest of the decade seeing Elvis Costello, Talking Heads, PiL, Dead Boys, Beastie Boys, Bad Brains, Gang of Four, Pere Ubu, Bob Marley, David Bowie, etc., etc. So I never saw The Who in the 80's - and I'm OK with that. I could go on, describing endless reunions, retirements and special appearances, but if it wasn't already over, the death of John Entwistle in 2002 sealed The Who's fate as a performing entity. They could no longer claim much more than a shadow's connection to their glory days. Even with the release of the terrific Endless Wire in 2006, which I played incessantly for several months, I felt no pull to see them live. Mounting their stadium tours left them too beholden to a past they could only hint at and I wasn't interested in watching them try. Daltrey and Townsend play Endless Wire at The Beacon? Two still-vital creative artists performing new songs? Sign me up. So I'm OK with never seeing The Who, or the Stones or Pink Floyd, to name a couple of other bands who have toured as a simulacrum of themselves. It's the same for me as Hendrix, The Doors, or The Beatles. I can accept that the time-space continuum just did not make it possible and I'm just too into the music to suspend disbelief that what I would be hearing could live up to the remarkable legacies of these bands. In the case of The Replacements, I was lucky enough to see them in their heyday, at The Ritz, and it was just as great as you can imagine. While I would love to see Paul Westerberg perform some of his most recent material (which is getting less recent all the time, dude), I didn't want to mess with my memories. Based on some of his remarks at ending the current reunion run, which only featured 50% of the original band, I think Westerberg may feel similarly. All the above is not even to mention the need to husband the limited resources - of both time and money - I have to see shows. For the cost of one ticket to see Clapton on his 70th birthday, I can have infinitely more satisfying experiences seeing Matthew E. White, Father John Misty, Kate Tempest, Natalie Prass and Holly Miranda - and that's just this year alone. The time is now for these artists, not in the past.